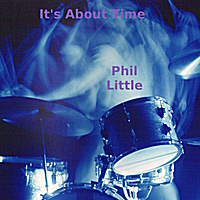 It's About Time is the second album by drummer and live music campaigner, Phil Little. Along with several guest appearances Phil plays guitar, bass and keyboards as well as drums and percussion, and explores the latin rhythms which have fascinated him. “It's About Time” by Phil Little, is a fruity mix of samba dance grooves, hybrid Latin mixes, soulful blues and rhythmical instrumental numbers which highlight Phil’s dedication to the drum. Most tracks are jam packed with live percussion of all flavours coupled with a myriad of melodic accompaniment from live instruments. The incredible cover picture was taken by Michael Kenna. Amabatucada takes you on a wild trip visiting the heart of Carnival. Mama Take Me Home, featuring the undulating accordion playing of Kenny Craddock (ex-Van Morrisson, George Harrison and Ginger Baker), takes you on a blissful trip through time & emotions. Blue Nights is a soulful blues ballad with the intense & raw vocals, of diva Mama Josie, getting the message across and the sensitive guitar of Eddie The Razor, who gigged along with Phil in Mama Josie and The Alley Cats. Coffee Train takes a percussive ride down from the mountain. There And Back is a percussion instrumental featuring drums from around the world. Samba In The Air is an uplifting Samba groove concluded by percussion feature. Except where stated, all instruments were played or programmed by Phil Little and It's About Time was recorded by mixed and produced by Phil at his Light From Darkness Studio.